This product was added to our database on Wednesday 26 March 2014. 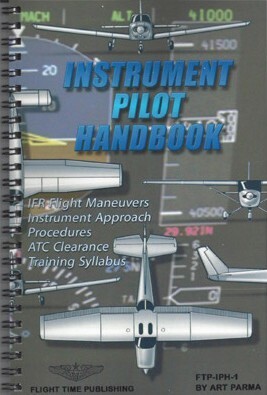 The INSTRUMENT PILOT HANDBOOK is the first and only IFR training handbook of its kind! The IPH provides 86 pages of essential information needed to conduct instrument flights while at the same time building a basic foundation of instrument skills necessary for safe IFR flights. Normal procedures and checklists are provided for every phase of IFR flight from pre-flight to shutdown. IFR communications and clearances are presented in a clear concise manner with examples and explanations. The basics of attitude instrument flight are outlined in order to build a foundation of good operating skills and safe flying habits. Instrument flight maneuvers and navigation are fully illustrated along with the step-by-step procedures and helpful tips. An IFR flight planning section presents instrument departures, enroute and arrival in a logical decision making format. The essential elements of making an instrument approach and landing under IFR are clearly defined and presented in an orderly fashion along with the checklist procedures and illustrations. Oral exam and flight test preparation checklists are also included to help the pilot prepare for the check ride with input from actual designated pilot examiners. Useful charts and information aid in quick organization and understanding of essential IFR rules and regulations.